I cooked up some barley for breakfast and decided to make some extra to cook up something for lunch. Of course, barley and mushrooms go together perfectly and were my first thought. I had some red chard that really needed to get used and soon, so I decided to go for it. My favorite spice with mushrooms is paprika, so I thought I would give it a whirl. This made four servings. I figure that if I am going to cook something for 45 minutes (the barley) I am going to make more than one meal out of it. When I cooked the barley, I strained it and saved all the barley water to use in this dish. I started with eight mushrooms that I cleaned and sliced. I patted them dry with a clean towel. I heated up a sauté pan and tossed them in and let them cook on medium high for about 8 minutes. This dry sauté evaporates out a lot of the fluid and enriches the mushroom flavor. Now when I cook them with the other ingredients, they will not get mushy. While it was sautéing, I would shake the pan every once in a while to keep them from sticking. Meanwhile I thoroughly cleaned a bunch of red chard, separating the leaves from the stems. Red chard requires several rinses and careful attention to be sure you get all the dirt off it. I hold it under the water and run my finger up and down the stem a few times to make sure all the dirt is gone. No one wants to bite down on some sand or dirt in their lunch. I chopped the stems into 1 inch long pieces. I also chopped 1/4 of white onions. Chopping up the leaves, I kept two cups and saved the rest for a salad. I set the red chard leaves aside for later. I added 1 tbsp of olive oil and swirled it around the pan. I added the red chard stems and onions. I added 2 tsp of paprika and salt and pepper. I sautéed everything until the onions were transparent. I then added the barley water I had saved from this morning. 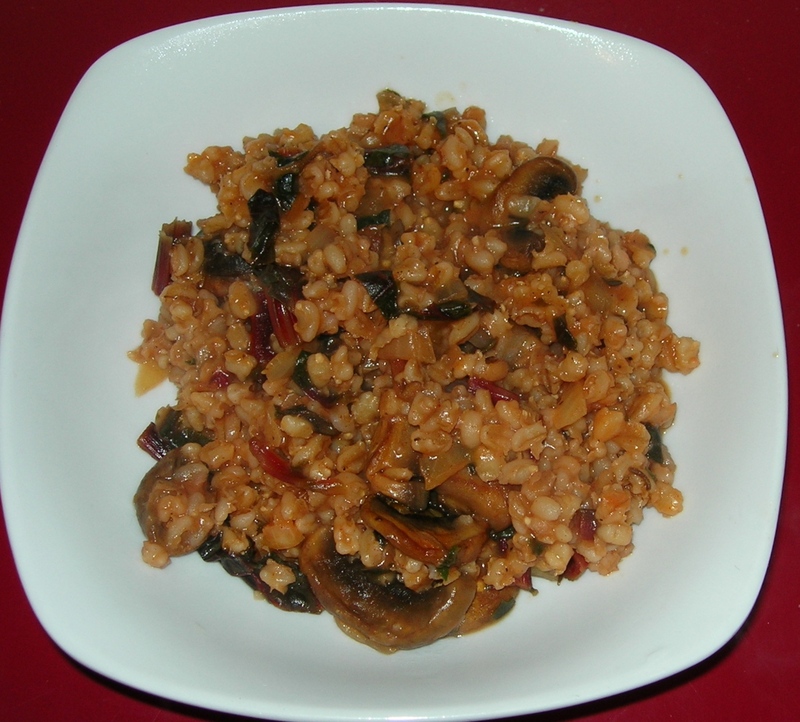 I added the red chard leaves and the 2 cups of cooked barley I had reserved. I let this simmer until the chard was done (3 to 5 minutes) and tasted tested it. It was good, but a bit one-dimensional – very umami, but the brightness of the chard stems was missing. So I squeezed the juice of one lemon at the end and that lifted up the chard flavor – giving a multi-layered flavor profile that begins with the heart umami of the mushrooms and barley and ending with a bright, fresh chard tartness. It was delicious.